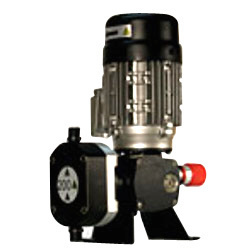 DOSTEC-40 dosing pumps are heavy duty, high precession, motor driven diaphragm pumps for dosing liquid products. This series allows many injection possibilities depending on the head being chosen. The available heads are: 25, 50, 100, 200, 300 & 500 l/hr for the piston series, and 25, 50, 100, 200, 300 l/hr for the Diaphragm series. 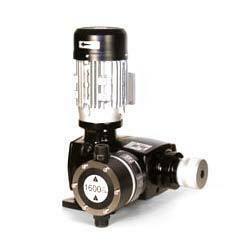 Electromechanical DOSTEC series dosing pumps are manufactured with materials that can resist most chemicals. They are designed for all sorts of processes where it is necessary to dose a product into a hydraulic network, such as food, textile, chemical industry, water treatment etc. Our offered range of Piston Dosing Pump (Dostec-50) is appreciated by the clients for their rugged and high designing along with superior quality. We are committed for the time bound delivery at any part of the country. We assure our clients for the rigid construction and superior efficiency of our offered Piston Dosing Pump (Dostec-50) as they are precisely tested on different quality parameters. This product is promptly designed by industry experts. Option for connect Variable Frequency Drive for providing 4-20 mA . We are a highly rated organization which is involved in offering Digraph Dosing Pump (Dostec-40) to our clients. Made from standard material by professionals, this Digraph Dosing Pump (Dostec-40) is quality tested and well finished from an excellent quality material. Along with this, offered product comes with accurate dimensions and great designing and is available at industry leading prices. Owing to years of experience in the industry, we render world-class range of Electrofertic Dosing Pump that is acclaimed for its exceptional quality and great output. Our offered product is manufactured under the supervision of our experienced professionals, thereby rendering utmost client’s satisfaction. Furthermore, we deliver the Electrofertic Dosing Pump in customized packaging and reasonable pricing.